The conference will include pre-conference tours and a workshop on moving images Friday morning. The conference program opens Friday afternoon with a keynote presentation by Deborah Thomas, manager for the National Digital Newspaper Program at the Library of Congress. 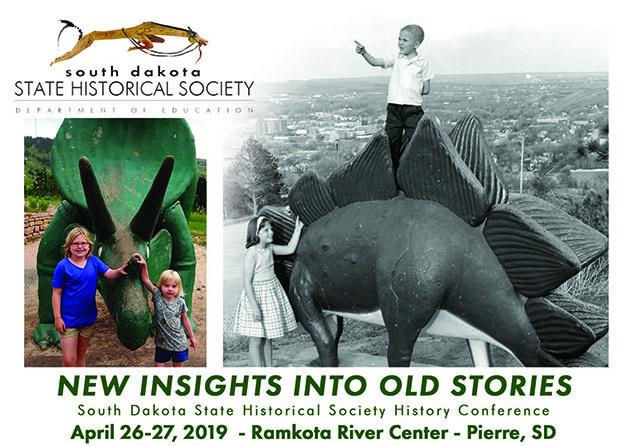 Additional sessions will include a showing of the “Governors’ Centennial Salute” film from 1961, a middle-school educator and students highlighting their South Dakota History Day projects, a presenter on the Harvey Dunn x-ray project, two professors from Dakota State University presenting on digital humanities, two presenters on using remote sensing data, a presentation on the South Dakota Public Broadcasting “Images of the Past,” a panel of project staff who are working on digitization projects across the state, and a family historian who will talk about how performing family genealogy has changed over the years. The Governors Awards for History and the State Historical Society trustee election dinner will be held Friday evening. Teachers can obtain one certificate renewal credit for attending. More detailed session information and registration information is available at https://history.sd.gov/aboutus/HistoryConference/ or by contacting the State Historical Society at 605-773-6000. For more information, contact the State Historical Society-Archives at 605-773-3804 or visit https://history.sd.gov.